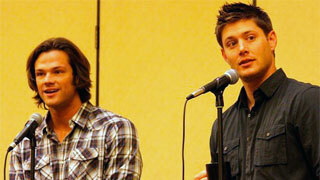 Here is all the links to everything “Salute to Supernatural” LA Convention. Pics, video, etc are all here, check it out. BURBANK, Calif. (March 29, 2010) – “Ghostfacers” – the new original shortform series/brand extension of the hit CW/Warner Bros. Television action-drama SUPERNATURAL – is set to premiere Thursday, April 15, on CWTV.com. The debut of the “Ghostfacers” digital series, starring AJ Buckley and Travis Wester as the world’s greatest self-proclaimed ghost hunters on a quest for the paranormal, coincides with the broadcast of the 100th episode of SUPERNATURAL, starring Jared Padalecki and Jensen Ackles, on The CW (Thursdays 9:00–10:00 p.m. ET/PT). The first two episodes will launch on April 15, followed by two additional episodes each Thursday for the next four weeks, for a total of 10 episodes. Each episode is approximately three to four minutes in length. On Monday, June 7, all 10 episodes of “Ghostfacers” will migrate from CWTV.com to TheWB.com. “Ghostfacers” follows a team of fearless and sometimes comical “professional” ghost hunters who investigate other-worldly sightings and record their own adventures in documentary-style episodes. In this first installment of the new series, the Ghostfacers team investigates the haunting of a local theatre by the spirit of a young starlet – played by Kelly Carlson (“Nip/Tuck”) – who, according to legend, was murdered in front of her dressing room mirror. Fans hungry for more “Ghostfacers” mythology can find additional images, character bios and video on the “Ghostfacers” website. In addition to Carlson guest starring, “Ghostfacers” stars AJ Buckley (SUPERNATURAL, “CSI: NY,” “Skateland”) as Ed Zeddmore, the team’s enthusiastic leader. Travis Wester (SUPERNATURAL, “Euro Trip,” “Cold Case”) stars as Harry Spengler, the co-founder of the team and tactical specialist. Brittany Ishibashi (SUPERNATURAL, “Notes From the Underbelly”) is Maggie Zeddmore, Ed’s adopted sister and the team’s tech-genius. Austin Basis (LIFE UNEXPECTED, “Curb Your Enthusiasm,” “NCIS”) stars as Kenny Spruce, the videographer and occasional shaman. Over the last two seasons, “Supernatural” brothers Sam (Jared Padalecki) and Dean (Jensen Ackles) have been drifting apart, to put it mildly. In the war of demons vs. angels, Sam is Lucifer’s most essential weapon, and Dean is heaven’s only hope. With the tension that’s been building between the brothers, fans want to know what it’ll take to repair Sam and Dean’s relationship. Zap2it was on the scene at Creation Entertainment’s Salute to Supernatural convention in Los Angeles to get some answers from Jensen Ackles and Jared Padalecki. Is that a hint that the Season 5 finale might not end with Sam and Dean on friendly terms? Ackles fills us in on Sam and Dean’s upcoming fight scene, explaining that it’s easier to do the choreographed fights with Jared because after five years of working together, they can easily read each other’s cues. “Rock bottom!” Padalecki interrupts teasingly. Uh-oh! Don’t worry, fans, you’re not the only ones who want Sam and Dean to reconcile. Keep checking in with Zap2it for more exclusive “Supernatural” content from Creation Entertainment’s Salute to Supernatural. There’s a death, but I wouldn’t exactly call it major. Prepare to see Castiel like you’ve never seen him before: royally pissed off. SUPETRNATURAL’S 100TH EPISODE STUNS WITH AN OLD FRIEND AND A SACRIFICE — Dean (Jensen Ackles) begins to think the only way to stop Lucifer is to say yes to Michael, but the angels decide they don’t need him anymore….. Dean, Sam (Jared Padalecki) and Castiel (Misha Collins) are horrified at the angels’ new game plan and take on Zachariah (guest star Kurt Fuller) to prevent an all out war on Earth. Meanwhile, a familiar face returns. Phil Sgrricia directed the episode written by Jeremy Carver (##518). Dean might say yes?, The angels have another game plan?, The guys face Zachariah?, Someone returns?! Can’t wait!